Recommended planting dates for dormant bare root plants. Some areas may have different guidelines due to microclimates, mountains, shoreline. Check with your County Extension office if you are unsure. How far apart do I plant my plants? Gardener's Guide for Planting Small Fruit Plants. When do I need to place my order? We are now processing order for 2018 spring season, so there is no set time you need to order however, we recommend you order as soon as possible as the later in the season you wait to order your variety may be sold out. Can I change my order or reschedule shipment? Effective April 1st no changes can be made to orders during the week the order is to ship, typically changes can be made up to 5 days before the order ships. When will you ship my order? We will ship your order when it is the appropriate time to plant in your area based on the USDA Hardiness Zone Map we will do our best to get your order shipped in a timely manner, but keep in mind it may not ship the same week as you ordered". When will you charge my credit card? For orders $100.00 or less payment is due in full at the time of the order, or a check can be mailed within 10 days. For orders over $100.00 a 25% deposit is due at the time of order with the balance due one week prior to shipping. Can I place an order by phone and mail a check for payment? 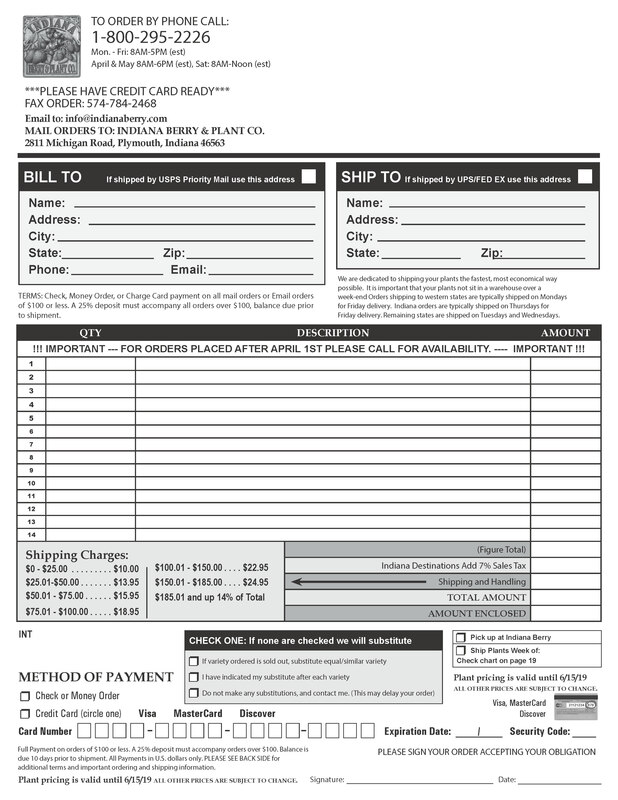 Yes, you can call us to place a order and we will let you how much the total order is so you can mail us a check. You can also print out the Order Form located on our Home Page, complete your order and mail along with your check. NOTE: Order will be held as waiting for payment for 10 days after those 10 days order may be cancel with out further notice. Can I visit your farm? While we are happy to have visitors to the farm. We have very little plants for fruit production as we are only propagating plants. If you would like to see our high tunnel and green house or even fields. late spring or summer would be the best time to visit. Please contact us to schedule a visit if you are interested (info@indianaberry.com). Please note for local customer, we do not have a retail store, however you can place your order in advance and we will have packed and ready for pickup, we ask that you give us 24 hours notice before pickup. We get many request to come and brouse our store, our facility consist of huge coolers full or dormant bare root plants, not accessible for the general public. PLEASE LOOK UNDER HELPFUL INFO AT THE TOP OF THE PAGE FOR VIDEOS ON OUR PLANT QUALITY AND HOW TO PLANT. Orders placed during December and paid in full by 12/31/18 receive a 5% discount off plants. We supply bare root strawberry plants, blueberry plants and much more for home and commercial growers. All of these berries are delicious and are packed with many vitamins that are great for the body. Our plants are viable and will provide you with many tasty fruits as long as you tend to the plant with routine care. Our home growers receive the same quality plant as our commercial customers. It doesn't matter if you buy one or one hundred plants from us, all will be in great condition. With the right amount of sun, rain and good soil, your plant will be plentiful with fruit after maturity. 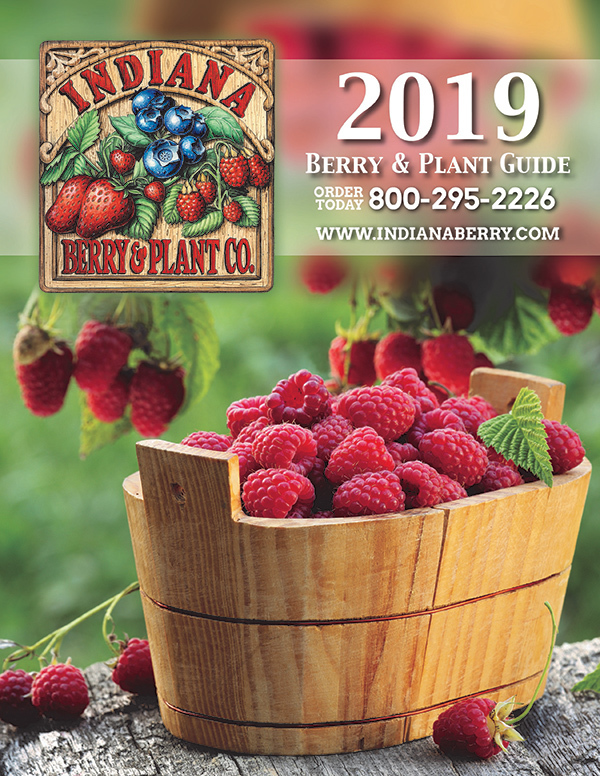 Our website gives you convenient and helpful information on the best ways to grow both strawberries and blueberries as well as all the other plants we offer. If you have any questions about our bare root strawberry plants or our blueberry plants for sale or any of the other plants we offer, please feel free to contact us. Gift certificates are mailed to you at your earliest convenience. Visit our Educational Links page to learn about growing plants. Request our most recent catalog to keep up to date!